My refreshing trip towards Hakone started off with my journey to Japan on the American Airlines Boeing 787 Dreamliner. 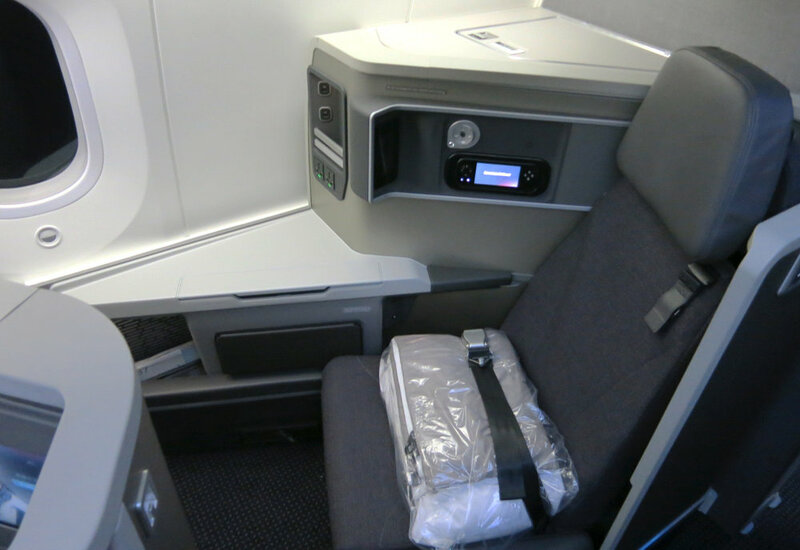 The Business class for American Airlines #27 offers herringbone seating. The reverse seats allow amplified privacy and comfort for each attending individual. The personal area is decently roomy where the visions from seated attendees are most generally out of sight from one another. This is a photo taken place before seating. Its orderly and well-suited presentation potentially makes the traveler feel as though they are in the caring hands by dutiful flight attendants. Traditional Washoku meal based on luxurious Tsukemono or "pickled things" in addition with tasty Ikura sprinkles etc. The spacious environment provides a calming atmosphere which adds on to a gentle yet solid taste to Japanese cuisines. Shinjuku Station is where my friend and I began our travels toward the Setsugetsuka Hotel in Hakone. The Odakyu Department store in Shinjuku is worth the experience through the populated areas to get your hold on Ekiben or railway boxed meals. The freshly prepared bentos with colorful fall scenery offers one with vast numbers of visual sensations with its aroma induced choices. Ekiben (駅弁) are sold at Japanese train stations and even inside Express trains or "fast trains". The choice has been set and I enjoyed myself with quality nutritious season-referenced meals. I ate my fulfilling meals from bentos on the Romancecar, which is Odakyu's train service with limited stops connecting Shinjuku Station with popular tourist areas like Hakone, Enoshima and Kamakura. *Note that, in the Romance car, seating for passengers must be reserved. Boarding the Romancecar from Shinjuku to Hakone-Yumoto. The photo when I transferred trains from the Romancecar to the Hakone-Tozan Train in order to get to Gora Station. Traveling to Gora Station took around 40 minutes from when I boarded on to the Hakone-Tozan. Taking the train from Shinjuku to Hakone takes around 1 hour and 40 minutes of travel time. After Arriving at Gora Station, a 2 minute walk took me directly to Setsugetsuka Hotel (雪月花 hotel meaning four seasoned hotel or seen as snow moon flower). The hotel is located in the mountain where one can experience a traditional style of Japanese Spa life. There is an outdoor and an indoor bath. Located outside are offerings of ice pops and Yakult drinks that are freely available for recreation. This hot bath is a carbonated hot spring having two of its kind here (one for men and one for women in separate locations). The room offered a vibrant green scenery of vegetation from its patio. The geta (traditional Japanese flip-flops) and cozy to wear clothing, samue (worn by Japanese Zen Buddhist monks are also worn casually as clothing) were provided in the room along with free wifi, a flat screen television, hair dryer, air conditioning, etc. If the footwear/clothing size(s) do not match or one wishes to wear another type of garment, like the Yukata (which is a causal version of the summer kimono), one may visit the lobby area to acquire them. Yukatas offered by the hotel come in a variety of different colors and sizes. The room had two beds with 3 extra futons or voluminous quilted mattresses. The patio includes a private bath. The other half of the patio photo shown: here. The dinner time is predetermined at either 17:30 or 20:00. Customers have the choice of choosing a time they wish to meal upon registration. *Note that dinner would not be prepared after 20:00. Dinner came with 2 options, the Kaiseki, an artistically prepared Japanese multi-course meal, or the shabu shabu, a Japanese style hotpot with boiled vegetables and thinly sliced meat one would dip to boil quickly and then eat with a preference of ponzu sauce, a citrus based soy-sauce, or sesame sauce. Both meals were visually complex in design and presentation with several courses containing more seafood than meat. The two courses were heavy in terms of quantity, and qualified by my standards of being breath taking quality cuisines. Setsugetsuka Hotel provides free coffee from 6:00-24:00, dessert from 17:30-18:30 and ramen noodles from 22:30-24:00. The restaurant presents itself with settings from both modern and traditional styles of Japanese display. Edo-like fashioned Japanese black pine is painted on the smooth wooden surface beyond the transparent glass wall. More of the restaurant table and the left side of the open area view beyond the glass barrier photo is shown: here. Nutritious japanese delicacy based from shrimp, egg to nebulous crystal appearances of mouthwatering deliciousness. Beloved sashimi with its politely dynamic flavors enhances umani synergy with soy sauce. A photo from the restaurant menu in Japanese shown here. From my experiences, tempura produced by luxurious eateries tend to have a thin batter covering to balance and lift the root tastes of fish and vegetable although I rarely visit expensive restaurants such as this place. Habitually produced Japanese hotpot warmed my body and soul along with an organic savory delight. The dessert here was extraordinary. My sense of taste vouches for them. I checked in at the hotel at 15:00 and then checked out the next morning at 11:00. After checking out of Setsugetsuka hotel, I walked a few minutes to Gora Station in order to ride the Hakone Tozan Cable Car. A board sign of Gora Station photo shown here. *Note that the Hakone railway would be closed during 2017 from January 10th (on Tuesday) through April 14th due to improvement in construction etc. The Hokone Tozan's cable car connects Gora Station to its final reaching point of the Souzan Station, at the mountain height of 767 meters (2,516 ft). It takes the cable car 10 minutes to get to Souzan Station traveling a total distance of roughly 1.2 kilometers. After arriving at Souzan Station, we took the Hakone Ropeway Service so that we can reach the Togendai Station. For information on Hakone Ropeway Service one may visit their website by clicking here. Togendai Station is reached in order for people to behold the lake Ashi as well as its volcanic fumes from Owakudani's volcano and on clear and sunny days, the grand beauty of Mount Fuji may be witnessed. Owakudani area is where a volcanic eruption by Mount Hakone from 3000 years ago created a crater. Today there is volcanic activity in the area of Odawakuni Valley where hot spring and fumes may experienced. Delicate individuals who possess asthma, bronchitis, heart disease, people using heart pacemaker and pregnant women should avoid this area for its high volcanic activity. Website information/map of Hakone & Owakudani by clicking here. The Hakone Shrine was witnessed across the lake Ashi, a crater lake from a volcanic eruption of 1170 CE, on a cooling misty day. This site is popular due to its view of Mount Fuji from this very angle on bright sunny days. On lake Ashi are Hakone Sightseeing Cruises and I took the one called the Royal 2. It possibly resembles a profiting sea captain's pirate ship. For information on Routes, Ports & Docks regarding the touring ships at lake Ashi visit this site here. In this photo we are traveling to Hakone Shrine after my lovely boat trip. Dense beautiful forests were around my field of vision. The soft matcha-colored frequency from the crowding forests would be difficult to head to the Hakone Shrine; therefore, it is pointed out by the torii gate positioned in lake Ashi and two other gates are placed at the main street on Moto-Hakone. The path further past the torii gate seen above eventually leads, with flanked lantern paths, to the Hakone Shrine where the shrouding of fog gives off a serene atmospheric gift. Lastly, my partner and I found our way back to the Moto-Hakone port and secured our boarding onto the Hakone-Tozan bus to the Hakone-Yamato Station which was roughly 40 minutes of travel time. Then we took the Romancecar back to Shinjuku Station. The Hakone trip was high quality as I was able to enjoy Hakone's soothing hot springs, sensual & exotic nourishment to its calming nature from flourishing greenness.